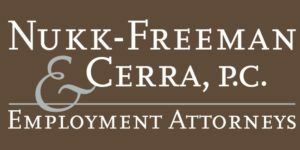 Home / Law Firm Members / Nukk-Freeman & Cerra, P.C. Recognized as one of the top employment law firms in the New York Metropolitan Area, NFC provides a progressive, creative and forward thinking approach to the practice of management-side employment law. Staffed with highly experienced employment attorneys and a robust support team, we deliver superior work product and incomparable client service. NFC attorneys have litigated thousands of cases and handled appeals at all levels in state and federal courts and before administrative agencies. Our substantive knowledge encompasses all areas of employment and benefits law. In addition, NFC has an entire team dedicated to developing meaningful and impactful employment law training. We work vigorously to counsel our clients on the most effective preventative measures. Nukk-Freeman & Cerra, P.C. is a 100% women-owned and WBENC Certified employment law firm providing counsel to businesses in all areas of employer-employee relations across a variety of fields including technology, pharmaceuticals, financial services, health care, manufacturing, construction, education, consumer products, and other service-oriented businesses. The firm has successfully litigated thousands of employment law cases and delivers unparalleled strategic litigation defense. Our core philosophy is to tactically help clients prevent employment law issues. When prevention is not possible, we vigorously defend against such claims. All of our attorneys are dedicated to preventative counseling and training on employment and benefits issues and have deep expertise advising on the various employment and benefits related issues that arise on a daily basis. At NFC, we are committed to diversity and the empowerment of women in the workplace. We continue to receive numerous awards and accolades recognizing our diversity efforts from the New Jersey Women Lawyers Association, Women’s Business Enterprise National Council, The Small Business Association’s “NJ Women in Business Champion of the Year” and the Alfred P. Sloan Foundation Award for “Business Excellence in Workplace Flexibility”. Allstate Insurance, Five Below, Horizon Blue Cross Blue Shield of New Jersey, MetLife, Morgan Stanley, Panasonic, Prudential Financial Services, Inc., Novartis, UPS, United Airlines, Valley Hospital, Walmart. Chambers USA, the highly regarded international legal research body, annually recognizes NFC as one of the top Employment Law Firms in New Jersey as well as singling out many of the Firm’s partners as leaders in their field. Listed in New Jersey Super Lawyers Magazine for 9 consecutive years, 14 NFC attorneys are included on their 2017 lists, including 6 attorneys on the “Top 50 Women Lawyers” list and 5 attorneys on the “Top 100 Lawyers” in the state list. Listed in 2016-2015, 2013, 2011-2010 as “One of the Fastest-Growing Private Companies in America” by Inc. Magazine.